This discussion was recorded on November 30, 2017. We partnered up with the Crocker Art Museum for its "Conversations that Matter" series to have a conversation about the future of the neighborhood that surrounds it -- Downtown Sacramento. It has been a little more than a year since the Golden 1 Center opened. The arena brought in a host of hot-ticket concerts and kicked off a slew of new development around it. Next up: development of the Railyards, revitalizing the riverfront, and making Old Sacramento more of a draw for the locals. But what are the plans for housing? For handling the homeless issue? For turning the still-too-many stretches of derelict buildings into something more pleasant? For parking and public transit? And making sure Downtown doesn't turn into an overpriced playground only a few can afford to enjoy? We're talking in the Crocker Museum's Friedman Court with a group of people in charge of handling these issues about what has changed in Downtown Sacramento, what has improved and what still needs work. PANELISTS * John Dangberg, assistant city manager for the City of Sacramento - he was the city's top person in charge of the Golden 1 Center's construction project, and now is focusing on more redevelopment of Downtown and development of the Railyards. * Brooksie Hughes, Old Sacramento District Director for the Downtown Sacramento Partnership - she's tasked with making Old Sacramento a more hip, happening place where locals equal, or even outnumber, out-of-town visitors. * Bay Miry - vice-president of development for D&S Development - first he helped turn R Street into one of the city's hottest nightlife destinations, now he's turning a section of K Street from eyesore to gateway to Golden 1 Center. 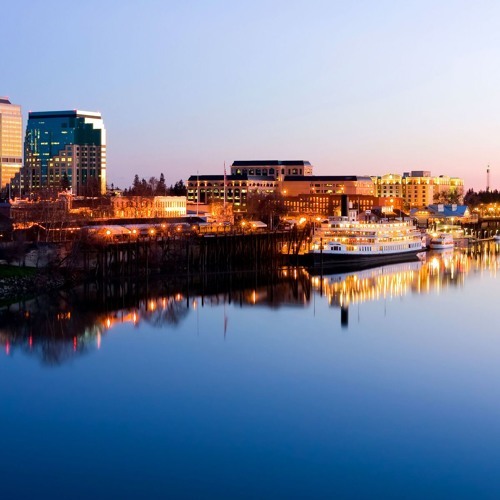 * Richard Rich - Railyards and Riverfront project manager for the City of Sacramento - a former "imagineer" for the Walt Disney Company, he's turning his imagination toward how Sacramento can revitalize the riverfront. PODCAST TIMEFRAME * 1 min, 45 sec - Erin Dorn of the Crocker Museum introduces "Conversations that Matter" * 4:20 min: Intro to California Groundbreakers * 10:35 min: Panelists introduce themselves and share their favorite spots in Downtown Sacramento * 23:40 min: "We've gone from a valuation of $22.5 million to well over $1 billion in value" - How the City built a downtown arena without spending a lot of money and taking on a lot of debt * 33:30 min: "We can utilize all these really cool basements in these really cool historic buildings" - Turning the 70O K St block from a run-down stretch into the city's next hot spot * 45:50 min: "Of those 124 stores, less than 10 of them are T-shirt and candy stores" - Making Old Sacramento a draw for the locals as well as the tourists * 51:25 min: "20 years from now, that area could be turned into a great marina and mixed-use area" - Revitalizing the Sacramento waterfront * 58 min: "After subsidies, it's still $150,000 that needs to come from the government - per unit" - How much housing can we build in Downtown Sacramento? * 1 hr, 10:10 min: "The big upshot would be linking the two sides of the river, where the most exciting things are happening" - Smart ways for putting bikes, cars, public transit and pedestrians together harmoniously downtown * 1 hr, 20:15 min: "We're reaching the point where companies like Raley's are looking at smaller concepts that don't need as many parking spaces, delivery trucks or building space" - Putting a grocery story and everyday services in the grand vision of downtown * 1 hr, 27:35 min: "We really want to directly incentivize job growth" - Creating high-value jobs in Downtown * 1 hr, 34:20 min - "Anything we can do to create artist pop-ups within the empty retail spaces, we're looking at programs to do that" - Putting art, culture and farm-to-fork efforts around Downtown.